This is a horrible place. I recommend you stay away. The end. It’s just that I’ve been having my phantasmagorical love affair with Patzcuaro, in central Michoacan state, for so long that I jealously attempt to guard it from new admirers. I fell in love with this pine- and wood-smoke-scented town long before there were caravans of SUVs from Morelia circling the plaza on weekends, or Wi-Fi, or cell phones. But despite a double-digit-percentage increase in population since the 1990s, Patzcuaro remains an engaging town of considerable charm. It was founded in 1533 by the Spanish, their first seat of power in this region of important Purépecha (Tarascan) religious centers. Despite the unfortunate and ubiquitous graffiti, Patzcuaro’s downtown is beautiful in the uniformity of its whitewashed adobe buildings roofed in moss-covered tiles. The bottom third of the buildings are painted maroon as a tribute to the town’s patron, the Virgin of Health (la Virgen de la Salud). Plaza Vasco de Quiroga, the town’s large main square, was originally slated to be an Indian market, or tianguis. For that reason it is today surrounded by picturesque hotels, restaurants, cafes and shops instead of government buildings and the cathedral, which would normally face a Mexican town’s plaza. Wandering the narrow cobblestone streets is a pleasure, as is visiting the many towns surrounding Lake Patzcuaro. Most of the towns in this region produce a specific type of handcraft: copper pots from Santa Clara del Cobre, violins and guitars from Paranda, and carved wooden items from Tzintzuntzan. Other nearby towns, like Zirahuen, are known for their colorful festivals and unique forms of music and dance. Humble Zirahuen has an excellent location on the shore of spring-fed lake of the same name, which is smaller and deeper than Lake Patzcuaro, and suitable for swimming. Here you can also take lake excursions and stay overnight in pretty cabins. Smaller Tecuena (“good honey” or “place where there is honey”) is home to about 10 families, max. Yunuen (“half moon” perhaps “elbow”) offers comfortable cabins so visitors can spend a night or two and enjoy their laid-back island lifestyle. Another excellent vantage point for seeing the entire lake area is El Estribo hill, where base-jumpers with colorful parachutes take off. (The rock road from town is a bit hard on the suspension; take a taxi and arrange for him to wait for you, or take a long walk back to town.) Lake Patzcuaro is shrinking; it’s about 40 percent of original size. 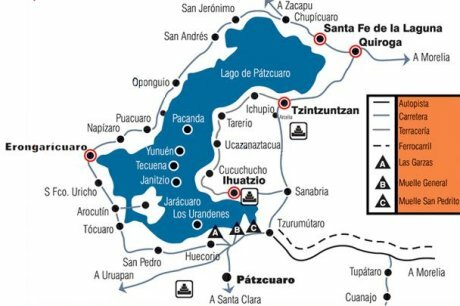 Ask a local to point out Jarácuaro and Urandén, two towns that were formerly on islands, now part of terra firma. The new 21st Century toll highway (Carretera XXI) cuts driving time from Patzcuaro to the coast to three hours. It’s a vast improvement over the curvy, dangerous old road to Acapulco. Called a “Maxipista” (as opposed to an “Autopista, or highway) this is only one lane each way, but divided and with a nice wide shoulder. The Maxipista has just a few tolls, and cuts driving time considerably, allowing travelers to easily combine a visit to traditional, colonial Patzcuaro with a trip to the undeveloped beaches of Michoacan state or the tourist meccas of Ixtapa and Zihuatanejo. For more information about hotels, restaurants and things to do, see the Patzcuaro Travel guide.